A home or office move can be a difficult task to organize. There are many things you will have to take into consideration and many arrangements to make. But moving from London to Portsmouth is easy when you work with Moving Service. We have been execute reliable and affordable domestic and office moves for years and we have seen it all! We have the proper tools, equipment and services to easily execute any office or home move, whether you are moving a 2 bedroom flat or an entire corporation. 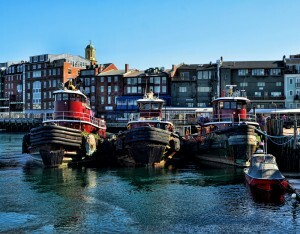 We offer you customized services packages when moving to Portsmouth so you pay only for the services you need. When you move with us, you can expect fast, efficient and reliable service. We work with you in the initial stages to come up with a moving plan that fits your busy schedule and budget. If you are moving a company or business, we can arrange to work on the weekends to minimize the impact on your business. We understand that in this modern world, time and money are essential and so we are committed to delivering you a fast and affordable service without sacrificing the quality. London to Portsmouth removals can be simple with our comprehensive services. To learn more about these services and get your Portsmouth move jumpstarted today, then contact us at 020 8746 4402 and speak to a sales representative to receive a free estimate. You can always expect affordable and honest service for your Portsmouth move when you work with us. Portsmouth is in the county of Hampshire which is located on the south coast of England. It is the UK’s only island city, located mainly on Portsea Island. It located 64 miles southwest of London. It has been an important port for centuries and is home to the worlds oldest dry dock, which is still in use today. Portsmouth has a population of approximately 207,000 people and it has a greater population density than London. It is the 13th largest urban area in the UK. There have been settlements since before to the Roman times, due to its strategic location near the sea. By the 14th century, the area imported wool, grain, whet, iron and wine through local trade routes across the canal and beyond. This contributed to its growth. Today, the city centre is the main shopping area and is home to a number of local and more general shops. Portsmouth offers a rich cultural life including cinemas, music venues, concerts and night spots. 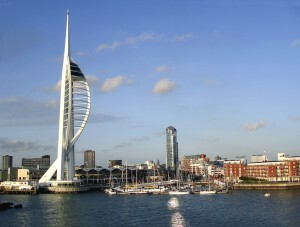 Its major landmark is the Spinnaker Tower, which was built in 2005 and offers viewing decks across the harbour. Portsmouth is well connected via road, train and sea routes. It is also near the Southampton Airport. It has become a major tourist attraction mainly due to its historic naval history. Don’t hesitate to call us at 020 8746 4402 to learn about our affordable and customized service options when moving to Portsmouth. We offer man and van service to Portsmouth and our professional staff can easily organize, pack and load your belongings into our state-of-the-art moving vehicle. They can also lift and carry heavy belongings like filing cabinets, laboratory equipment and mattresses up and down stairwells. We will also re-assemble all your larger furniture or equipment at your new residence in Portsmouth to relieve the moving stress. Our prices are extremely affordable and our service is top-notch guaranteed. We have years of experience moving homes, apartments and offices to Portsmouth and we know exactly what to expect. Contact us today for a reliable and affordable removal service from London to Portsmouth.